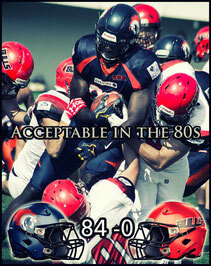 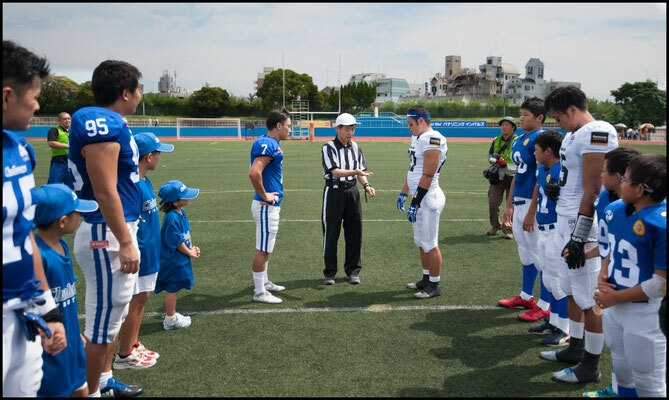 Panasonic Impulse dominated division rival Asahi Soft Drink Challengers in a 46-7 humiliation. 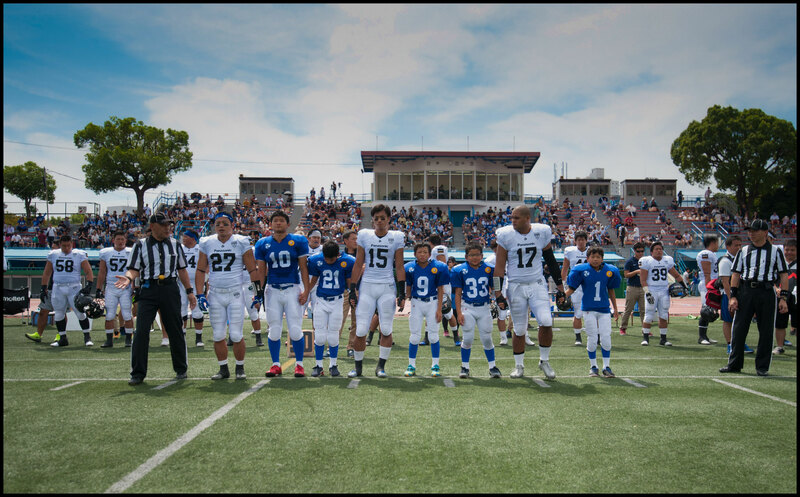 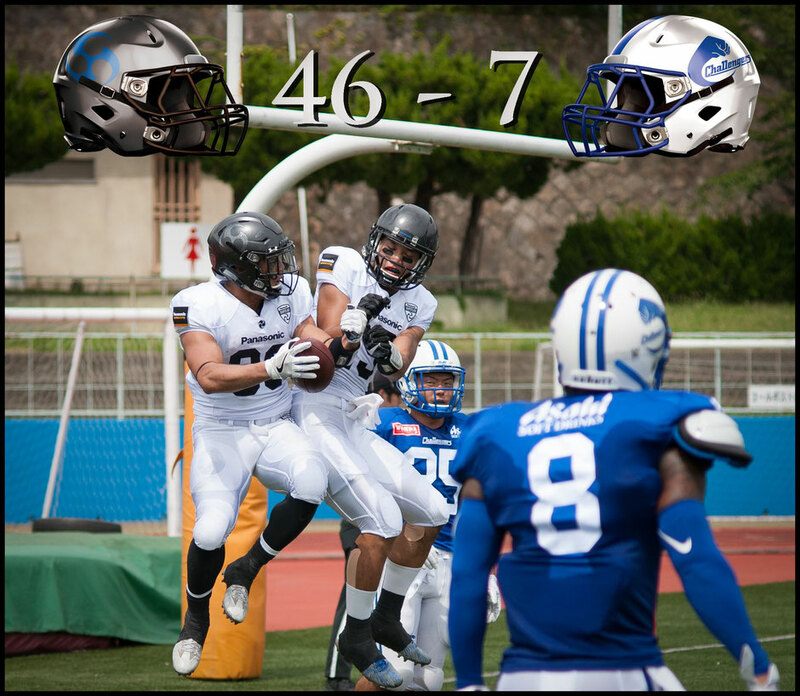 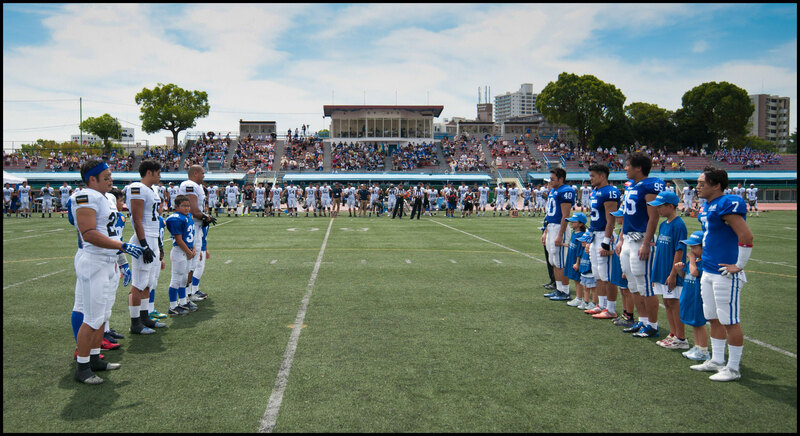 Both teams were coming off week one wins and were playing for top spot in the west division rankings. 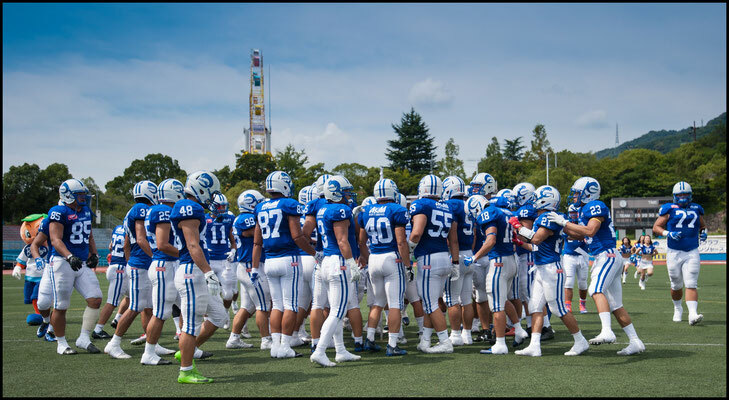 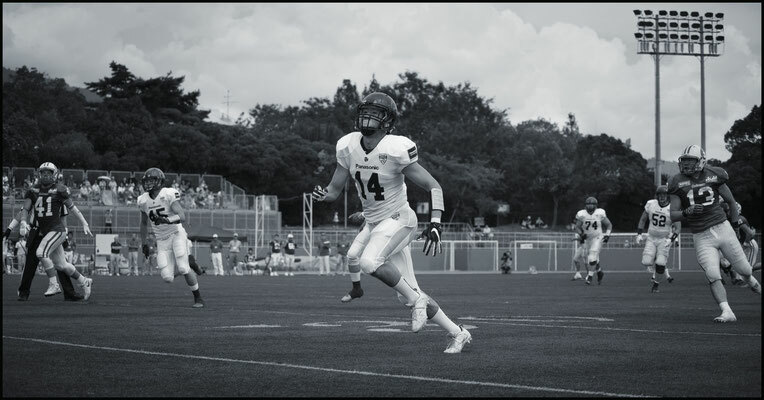 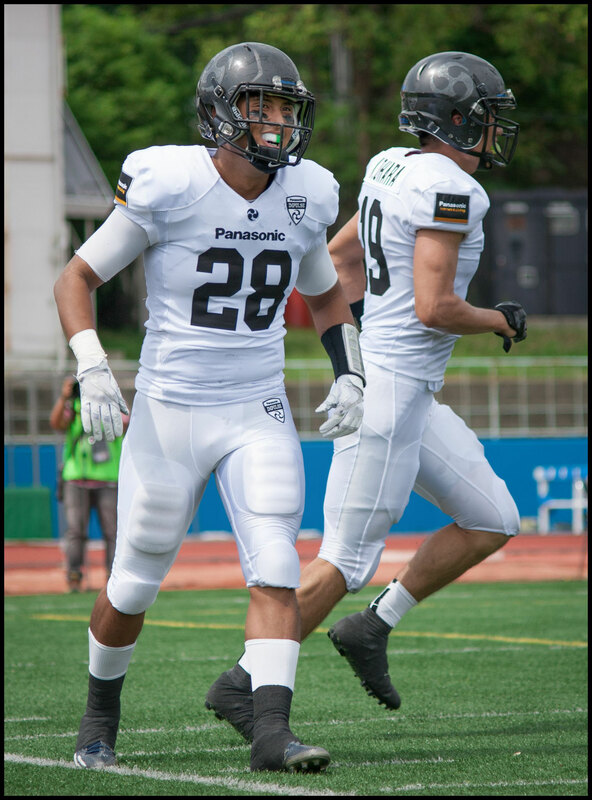 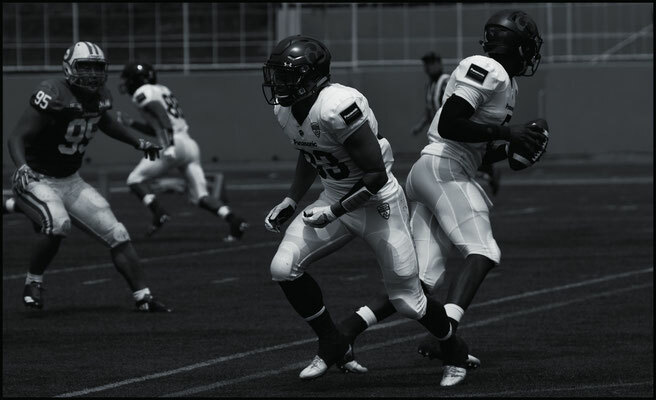 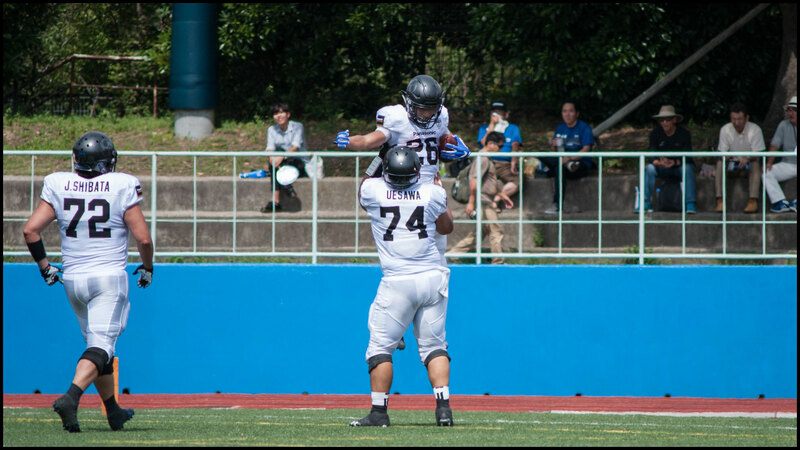 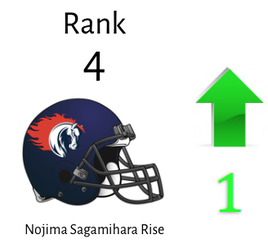 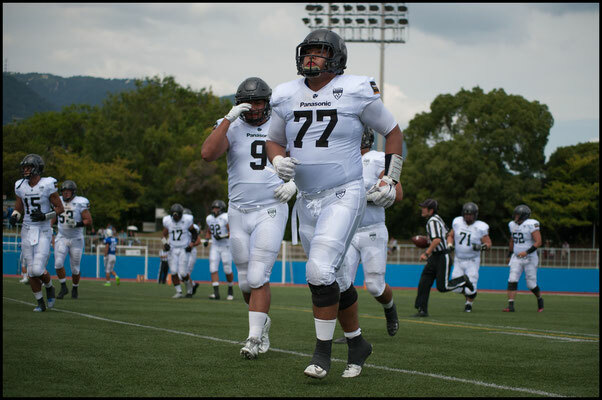 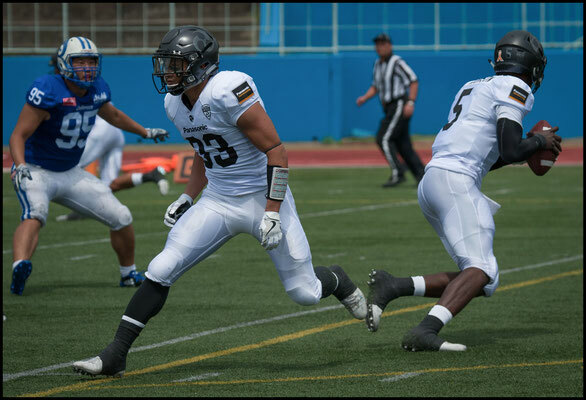 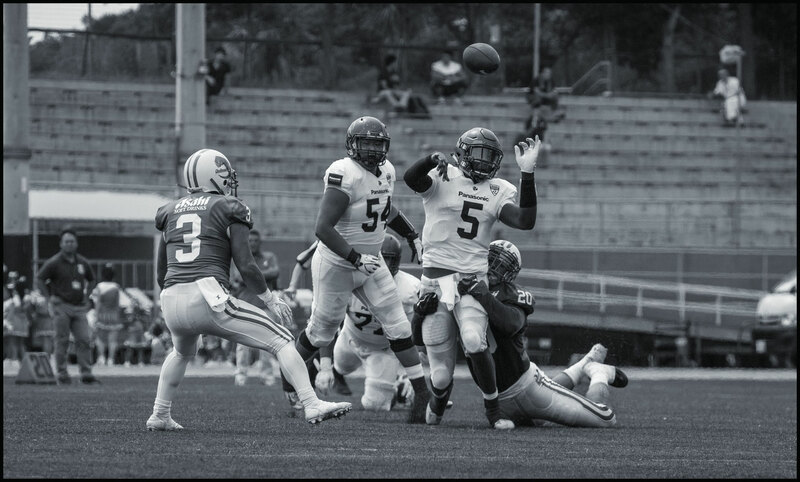 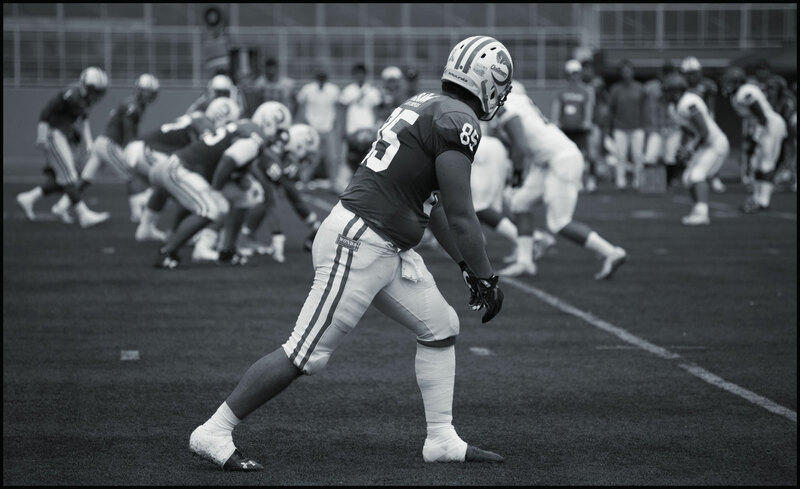 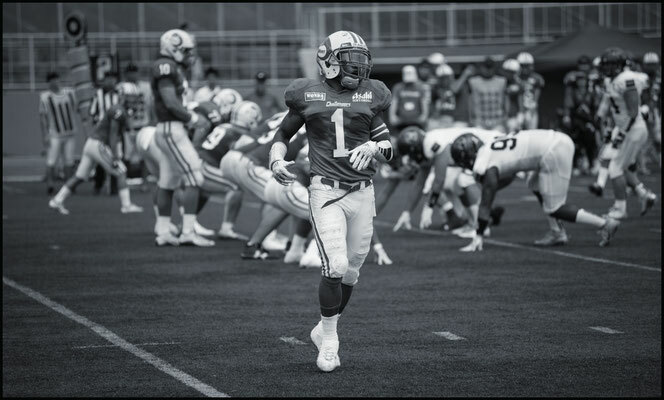 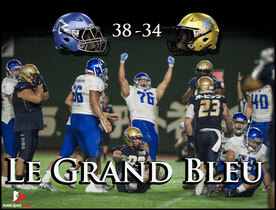 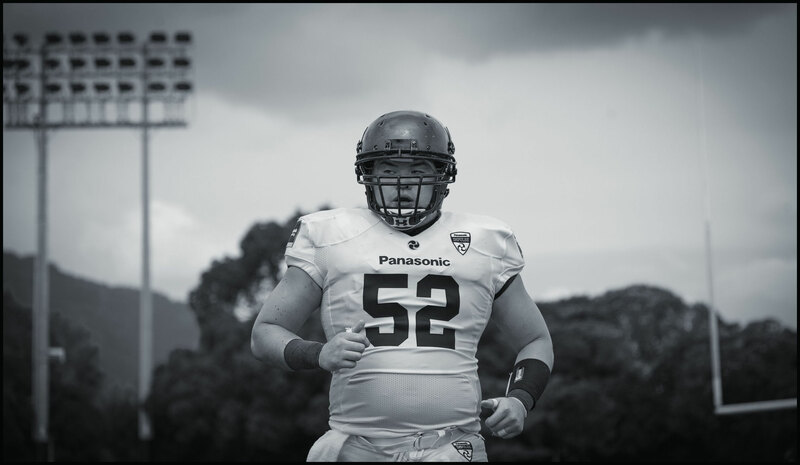 The Impulse left no doubt about their supremacy, running a well-oiled machine on offense and defense, and enjoyed a return to form for kicker Eita Saeki who went 3 for 3 on FGs and 5 for 5 on PATs. 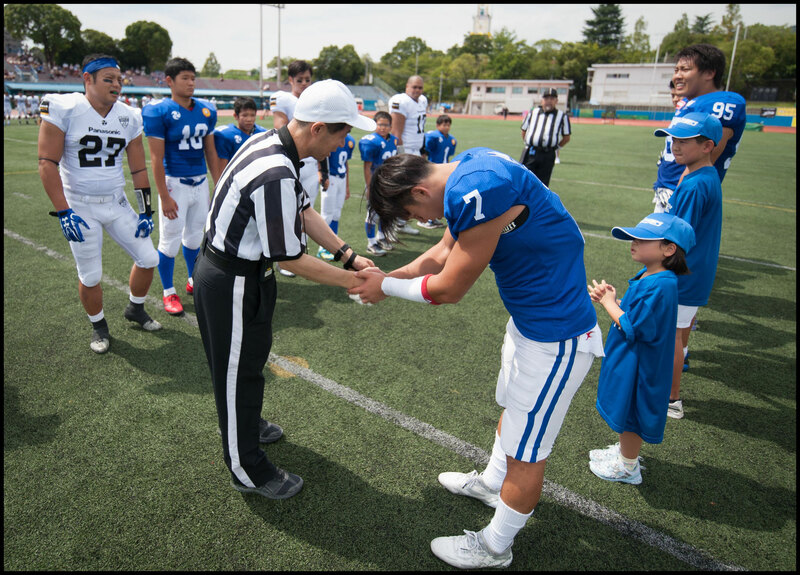 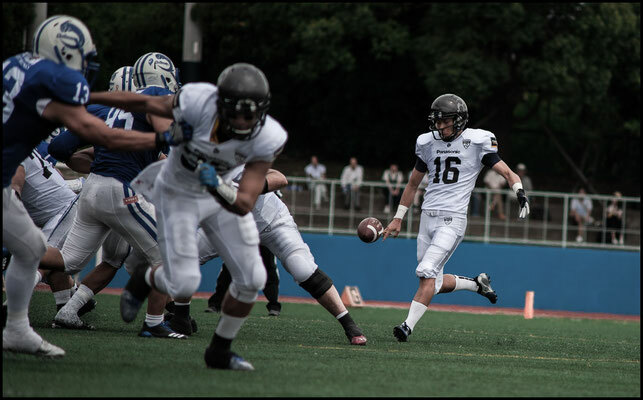 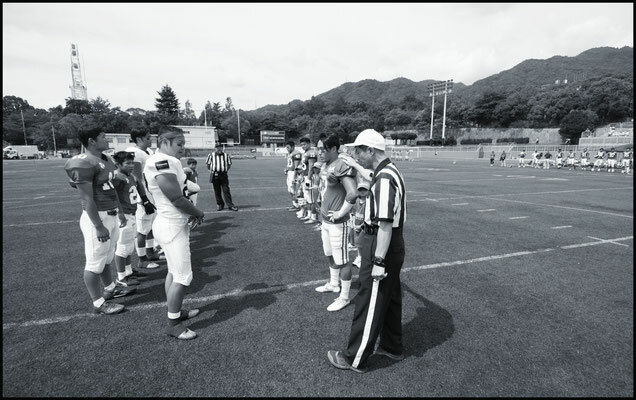 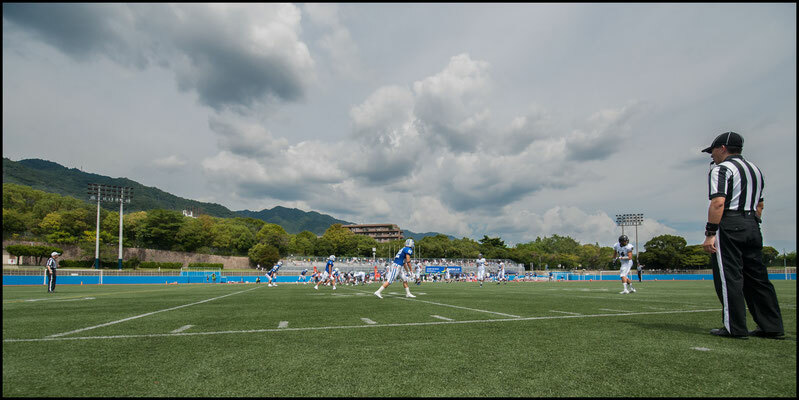 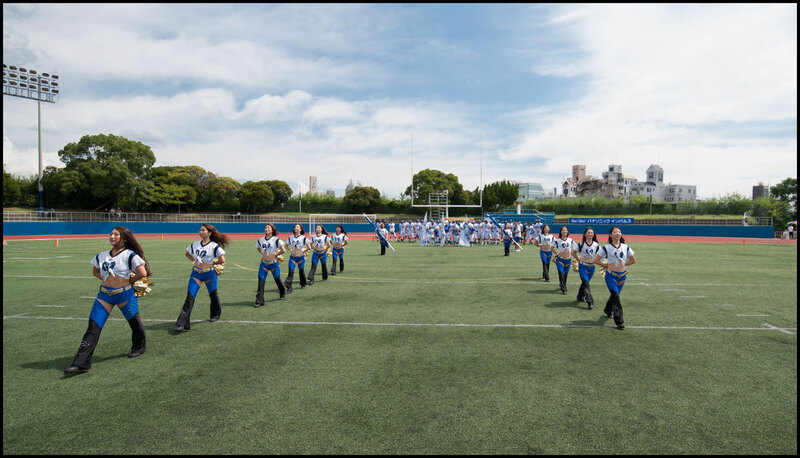 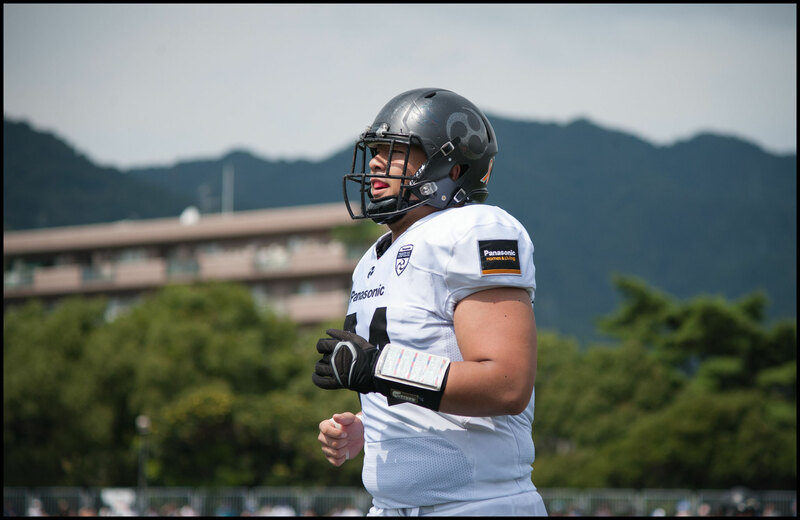 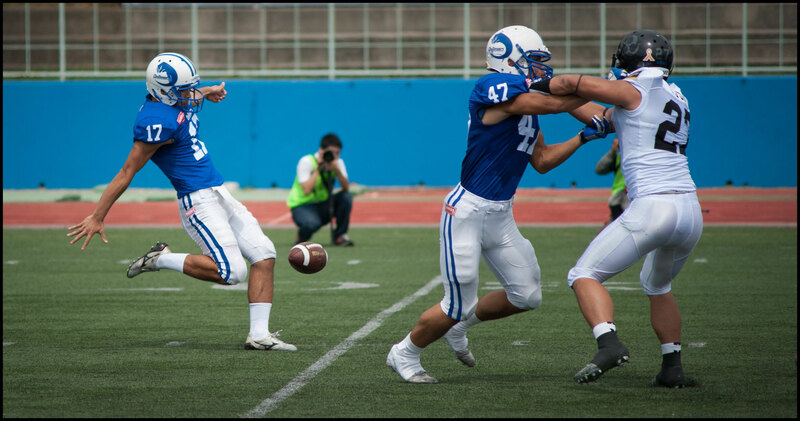 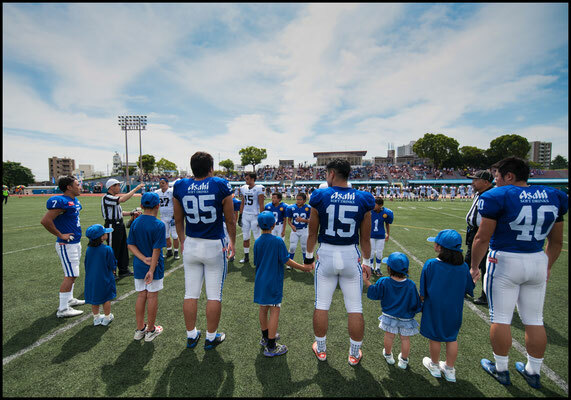 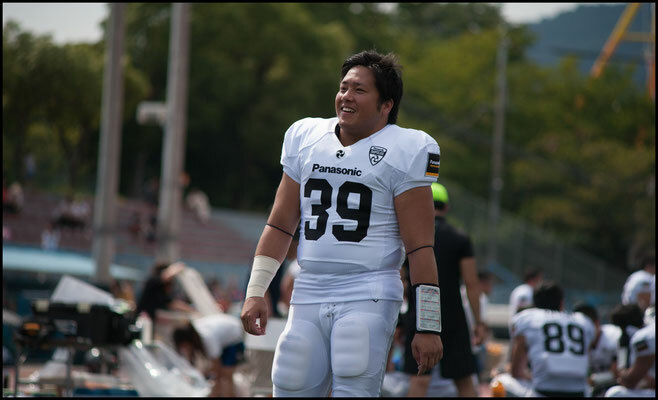 Eita’s brother, Shintaro, is Panasonic’s punter and he showed off his skills as well, looping a first quarter punt perfectly inside the one-yard line. 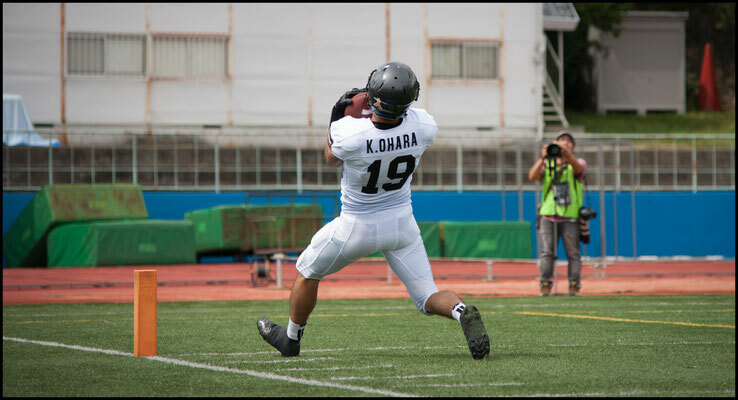 On that play, the right footed Shintaro angled the ball toward the left sideline where his teammate Kei Ohara tracked the ball coming directly behind him. Ohara made an incredible basket catch facing away from the play. 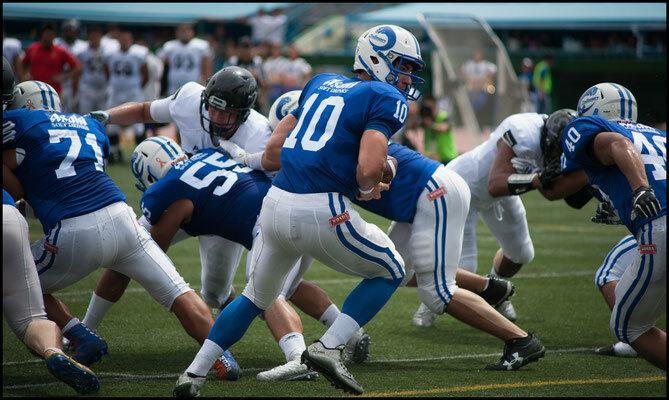 In one motion, he arched backwards and fell to the ground, catching the ball on the fly as it came straight over his head. 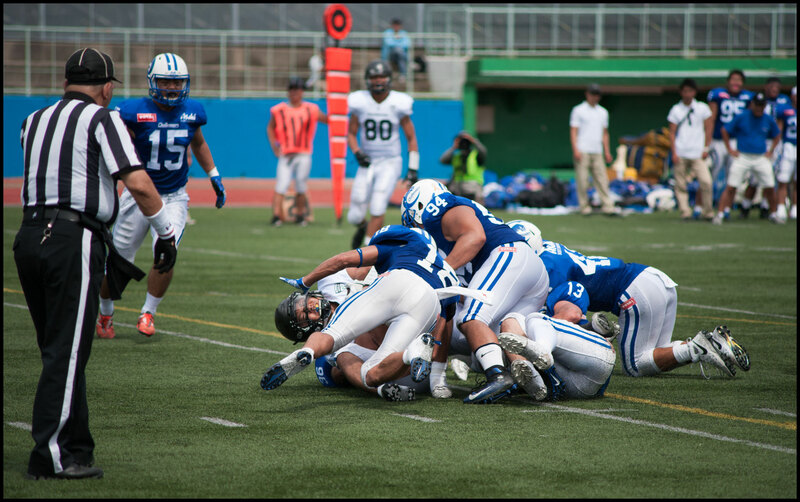 He downed the ball just short of the goal line. That left the Challengers lining up in their own end zone and trying to run the ball out. 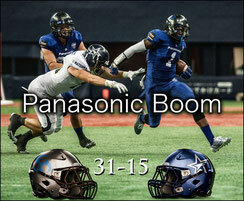 Panasonic’s David Motu wouldn’t let them. 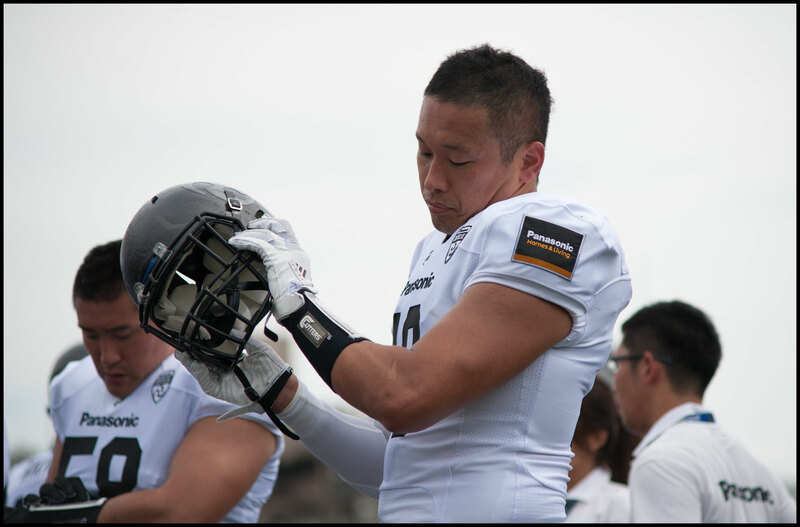 He stuffed Masaki Kawabuchi in the end zone for a safety. 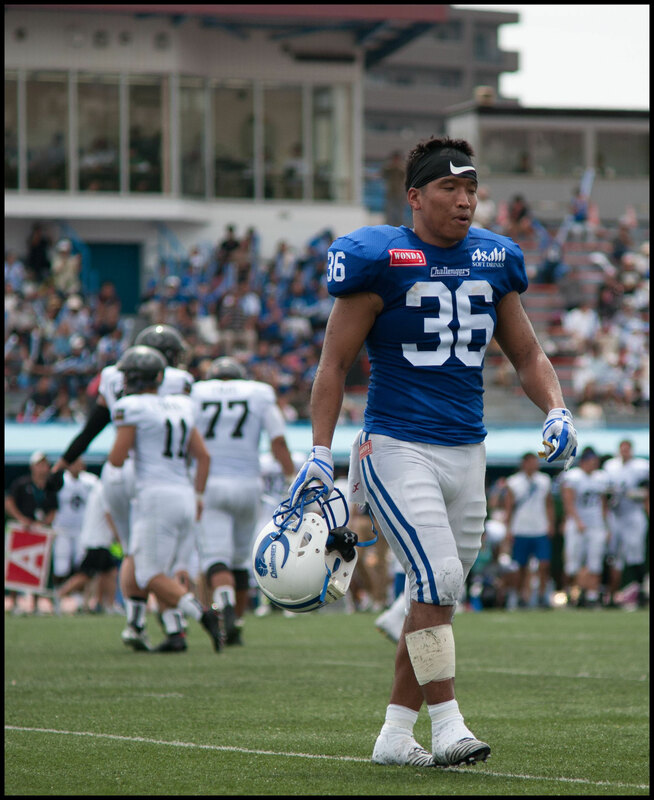 Motu later said, “just beat the man in front of you and good things happen.” Right from the start Motu was beating his man and causing commotion in the Asahi backfield. 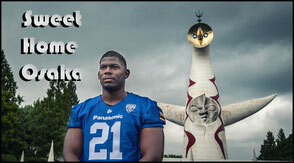 He had also been a part of an earlier play that led to a turnover on Asahi’s opening drive. 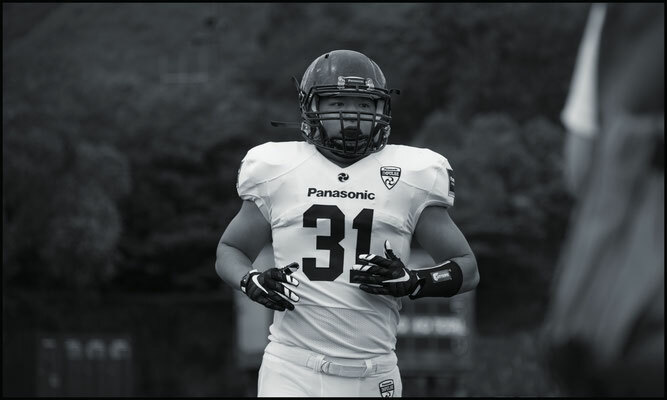 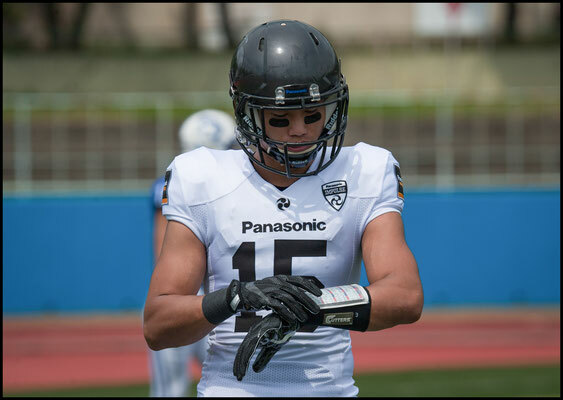 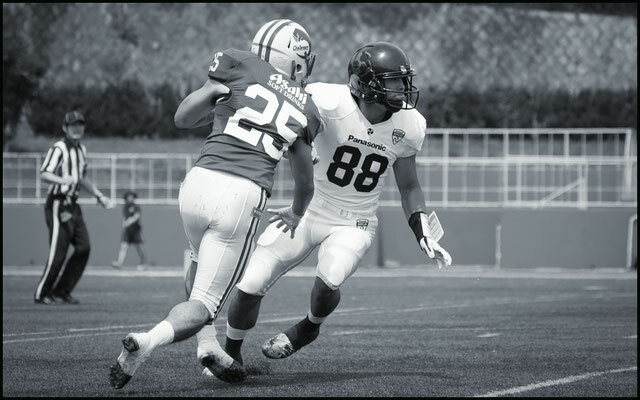 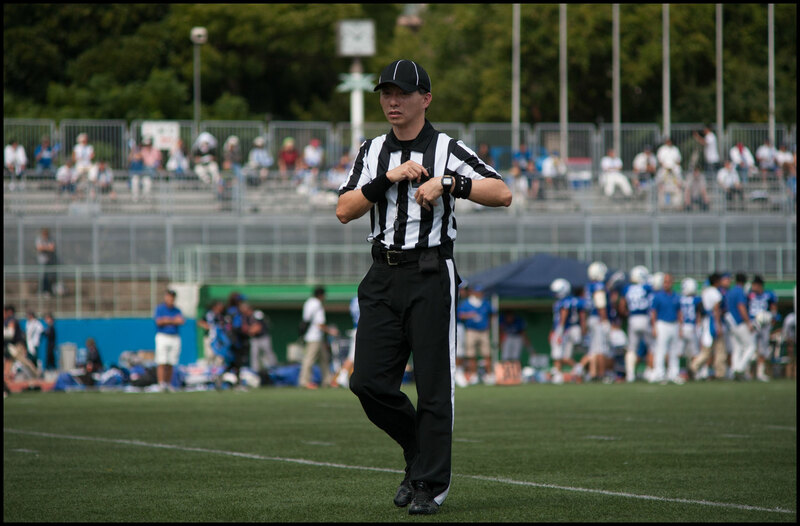 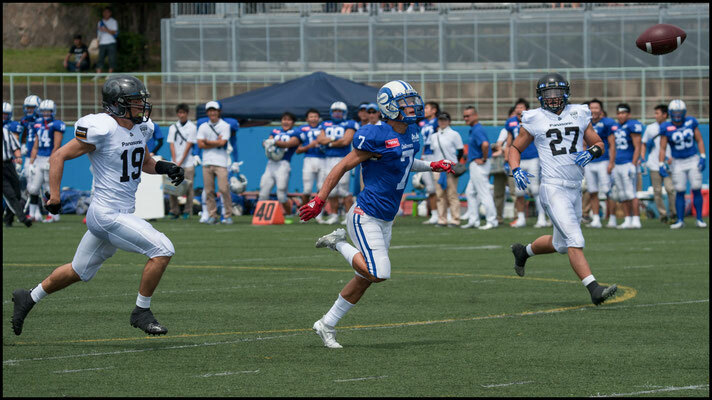 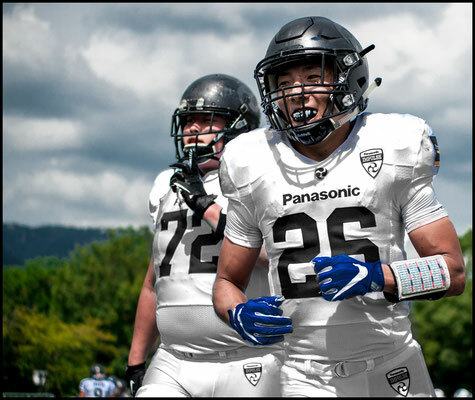 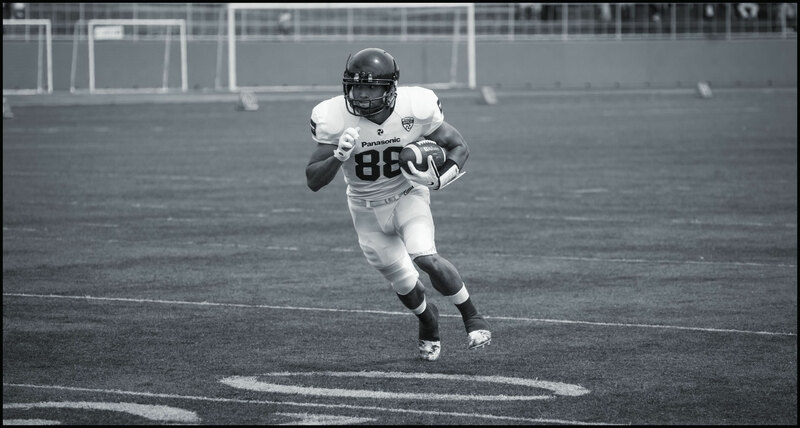 Panasonic quickly added a TD on a 9-yard run by Jun Yokota, who leads the team with three TDs on the season. 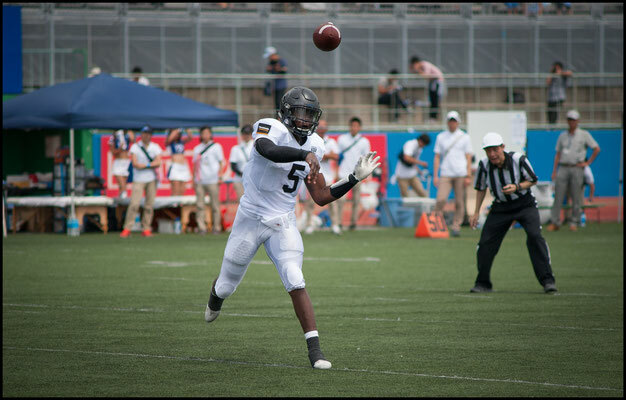 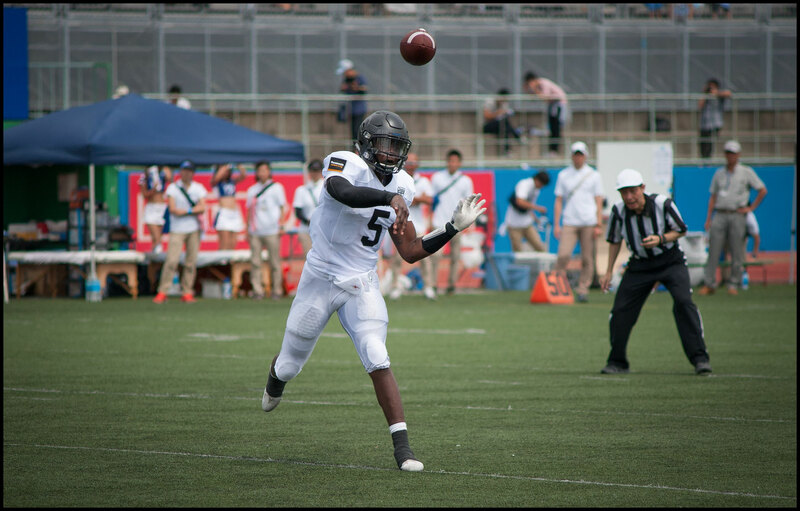 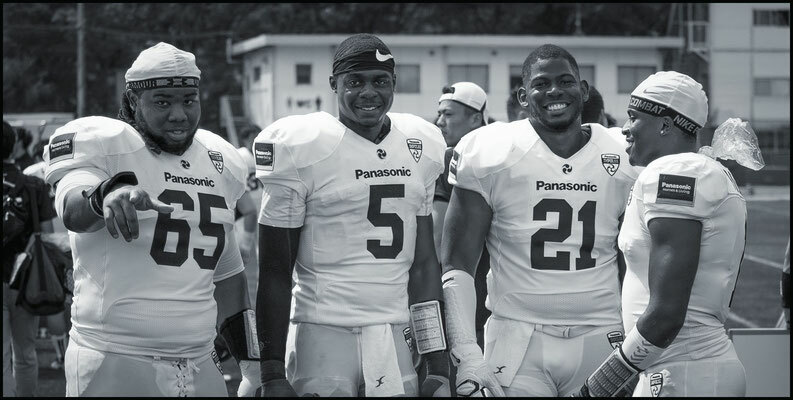 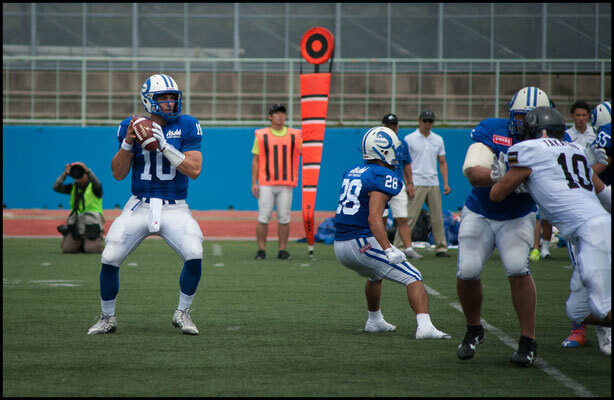 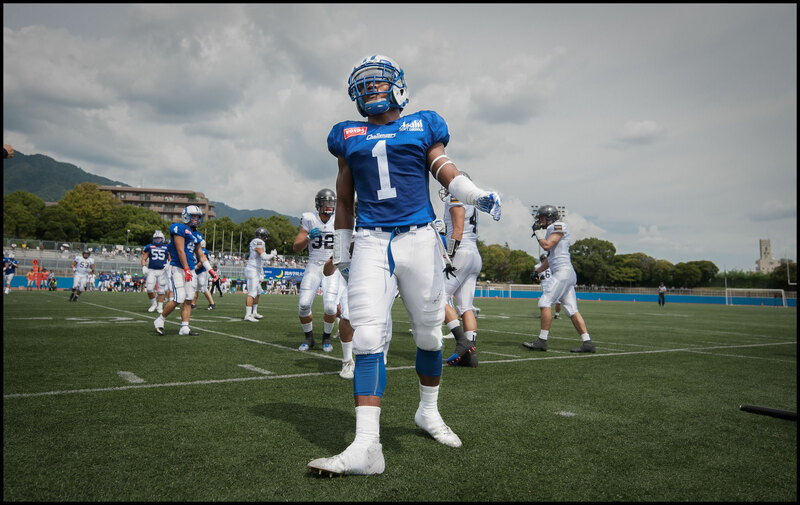 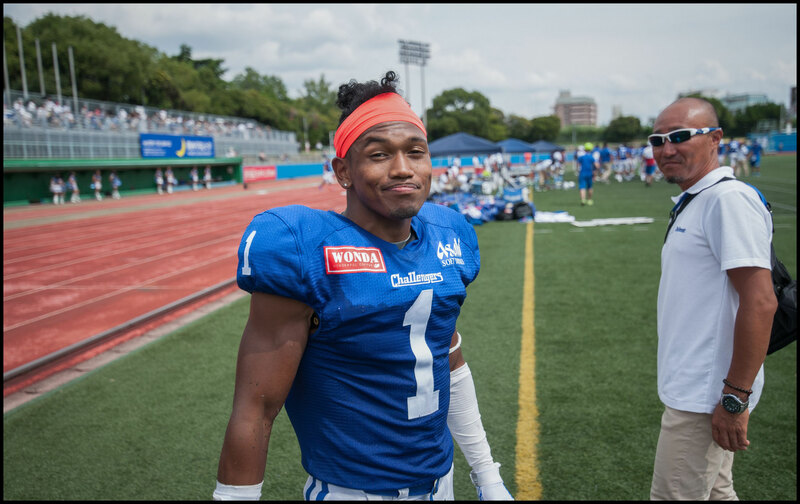 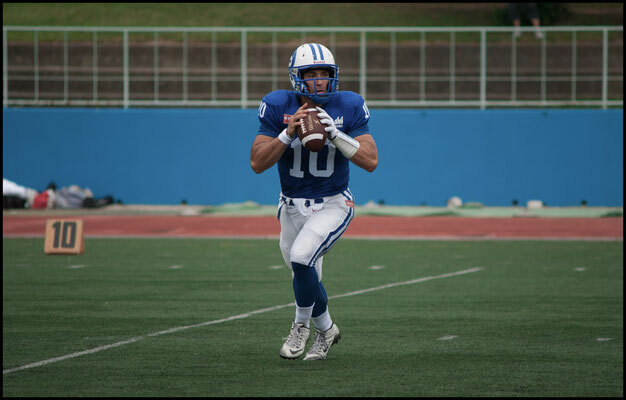 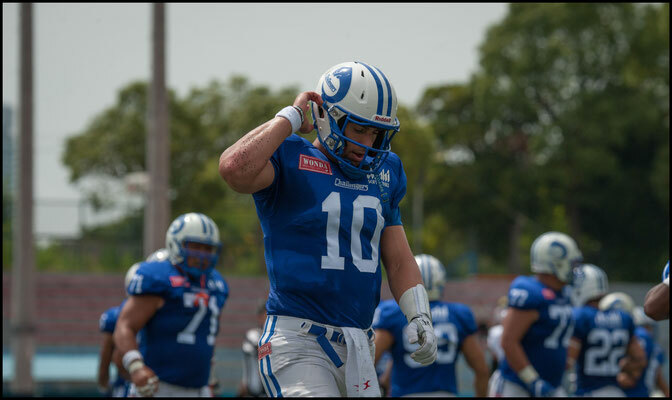 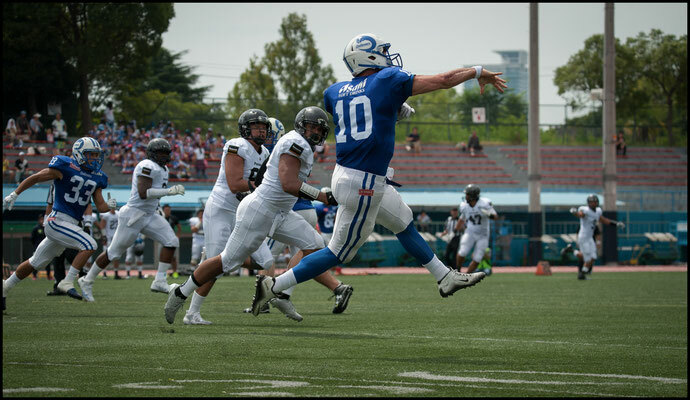 Trying to keep up with Yokota, fellow RBs Hiroaki Suga and Takuya Fujimoto also got rushing TDs as did starting QB Ben Anderson. 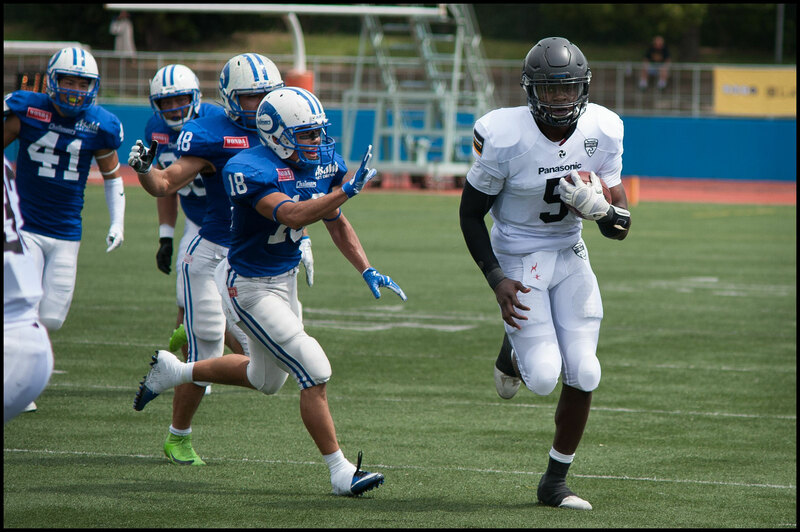 After Yokota’s TD the Impulse were up 12-0. 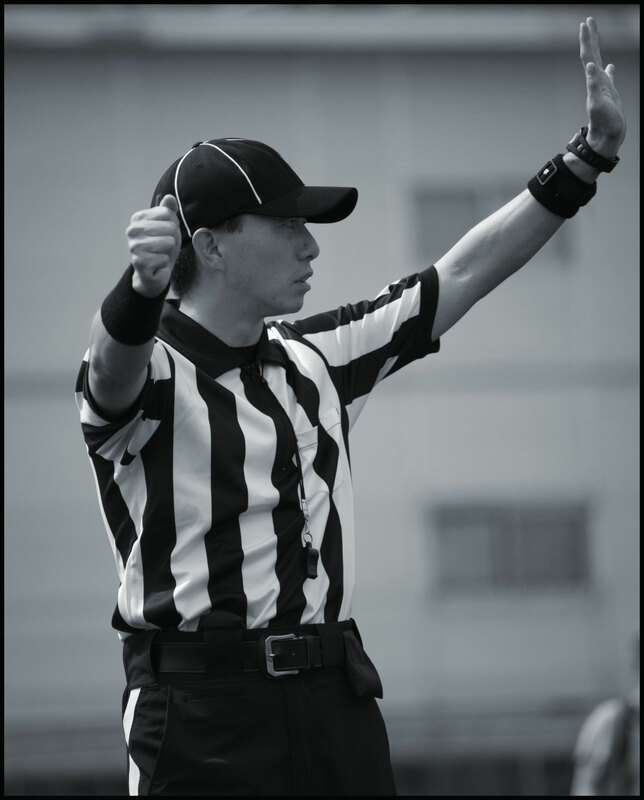 They were driving again as the first quarter ended. 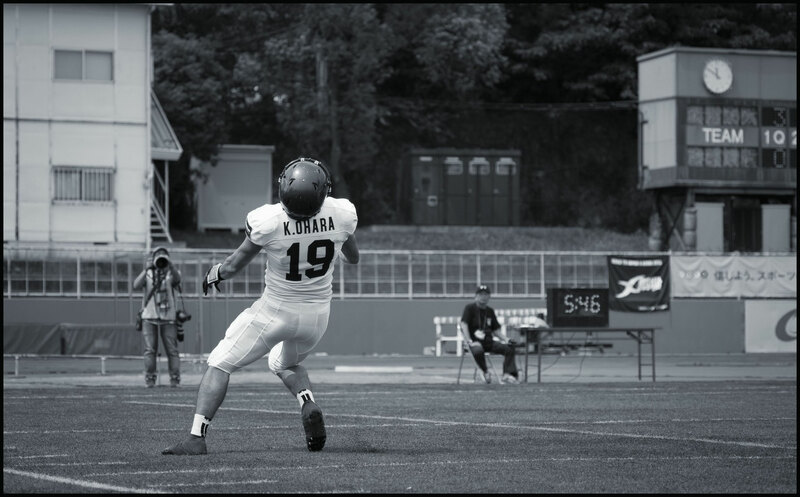 That drive saw a terrific catch by WR Takato Kida, who went diving and sliding across the middle of the field with a defender on his back and ended up in the end zone. 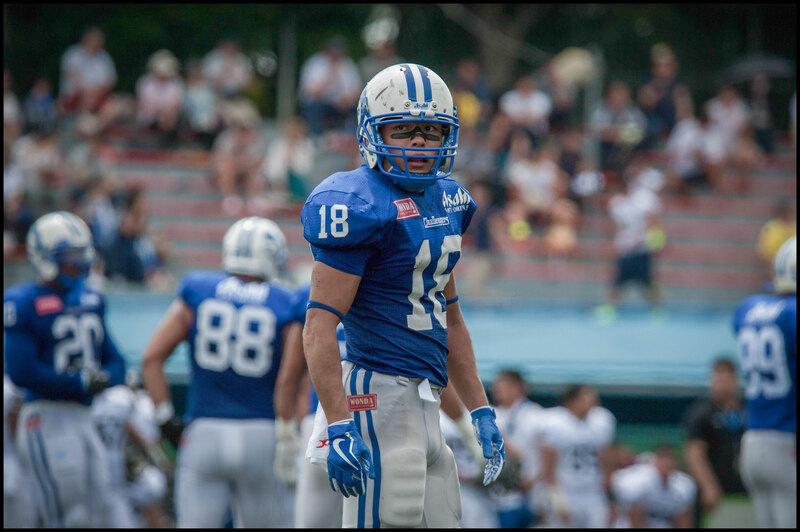 Despite the 19-0 score, Asahi quarterback Alex Niznak couldn’t be deterred. 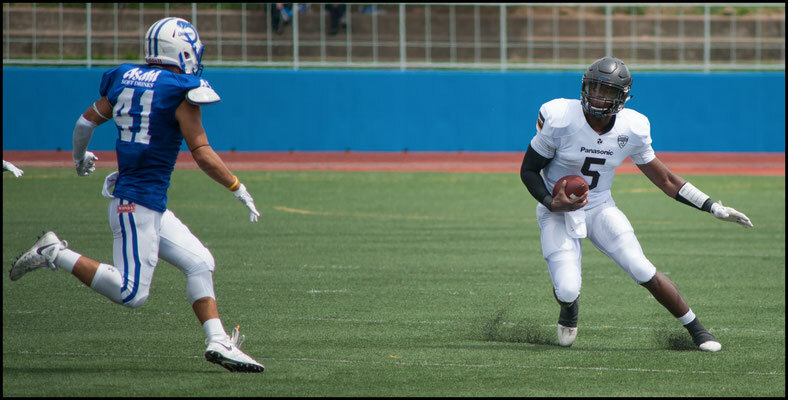 In the second quarter, he fought back with a deep ball to a leaping Donnie King. 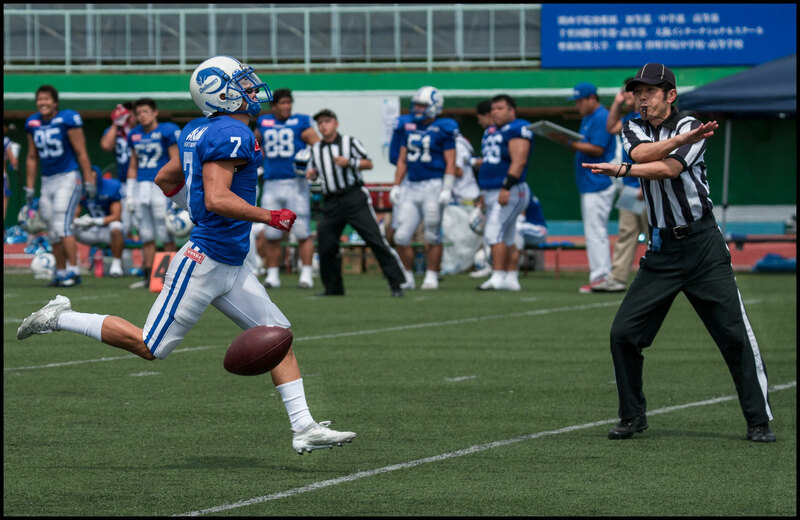 Showing no ill effects of a big hit he had taken earlier in the game, King did what he does best, eyeing the ball, timing his jump and outmuscling the defense. 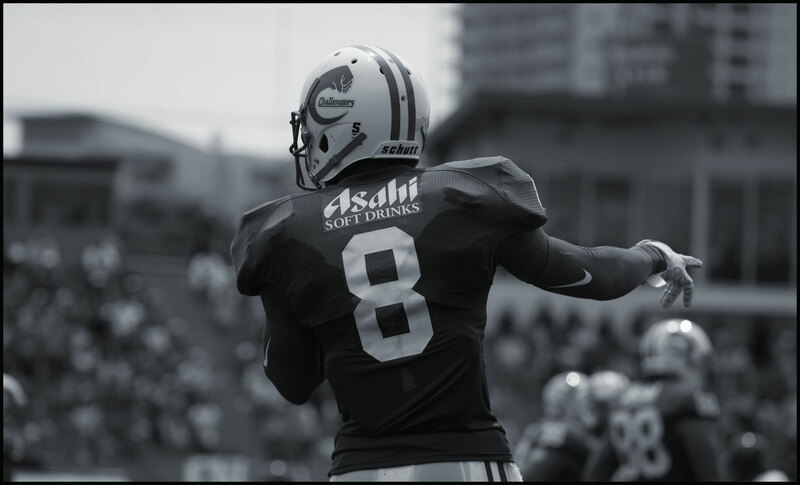 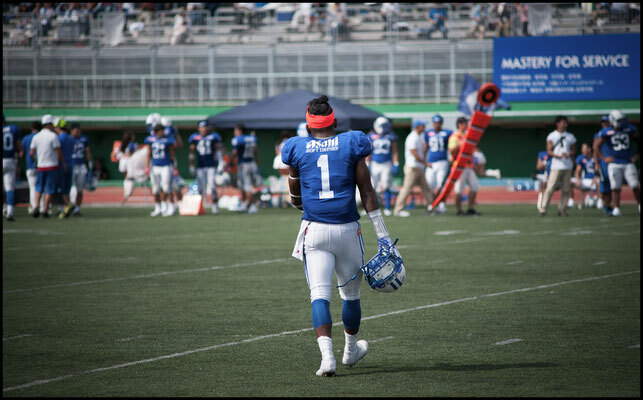 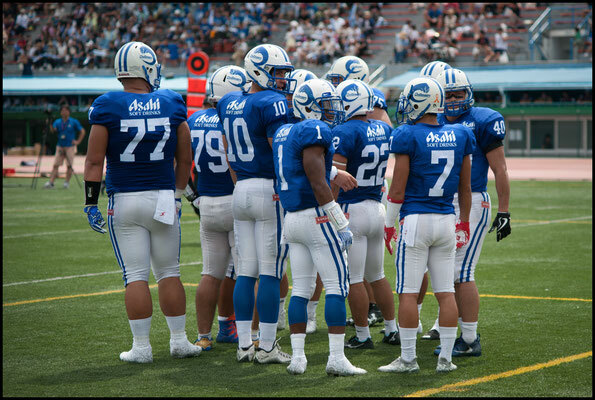 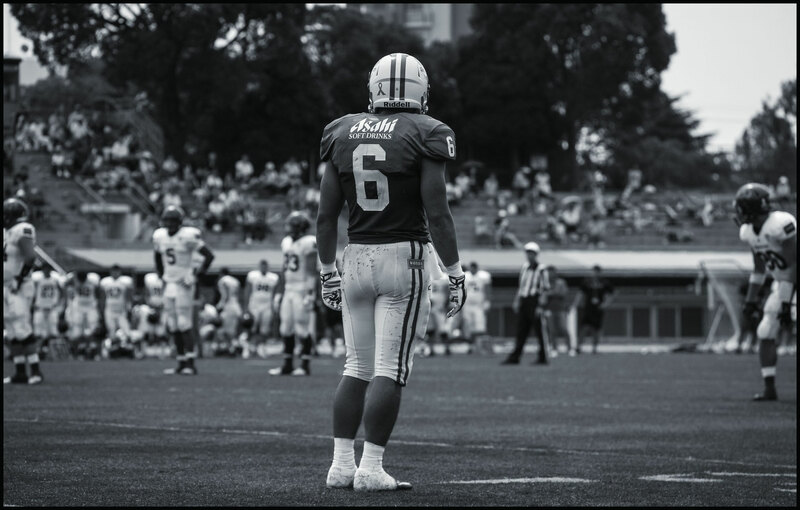 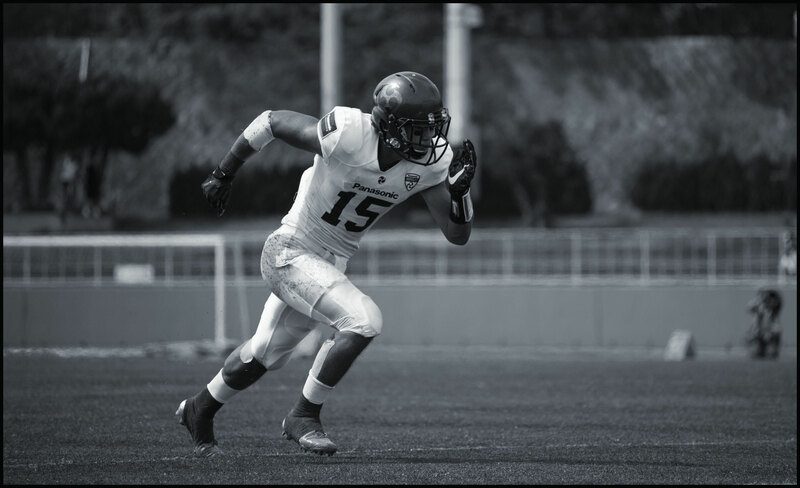 King came down with a 34-yard reception on that play and Asahi’s offense was finally gaining some traction. 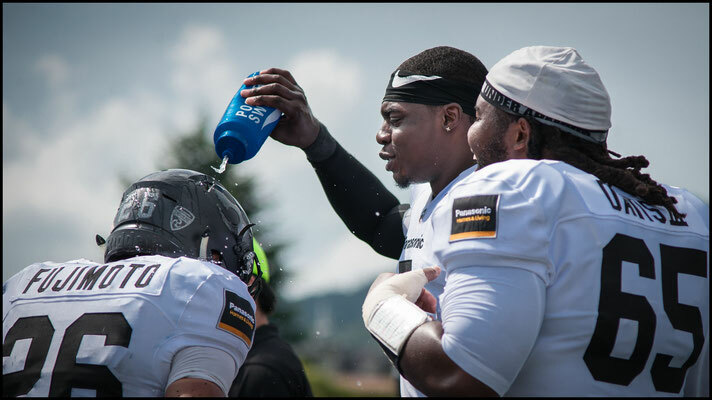 Unfortunately for Niznak and the Challengers, David Motu was still on the field and he delivered again with a 14-yard loss on a sack that killed the drive. 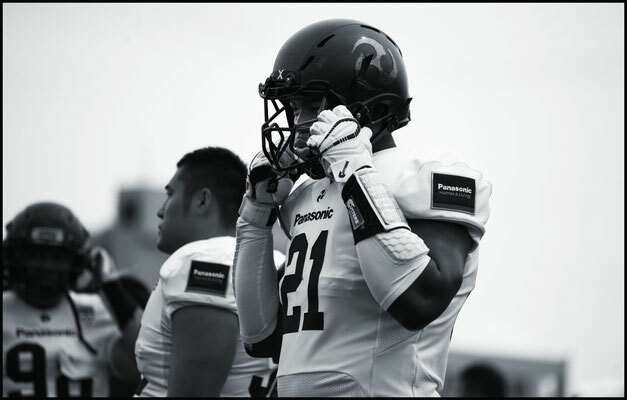 Panasonic immediately demonstrated why they are so dangerous on offense with QB Ben Anderson scrambling for a first down, one of 18 on the day for the Impulse. Then Anderson connected with WR Tatsuya Tonka at midfield. 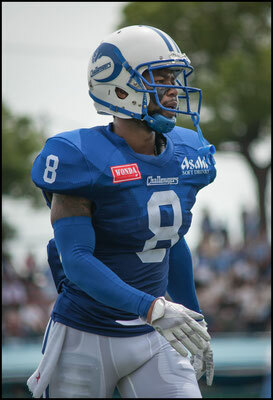 Tonka added the remaining 50 yards after the catch for a 59-yard TD. 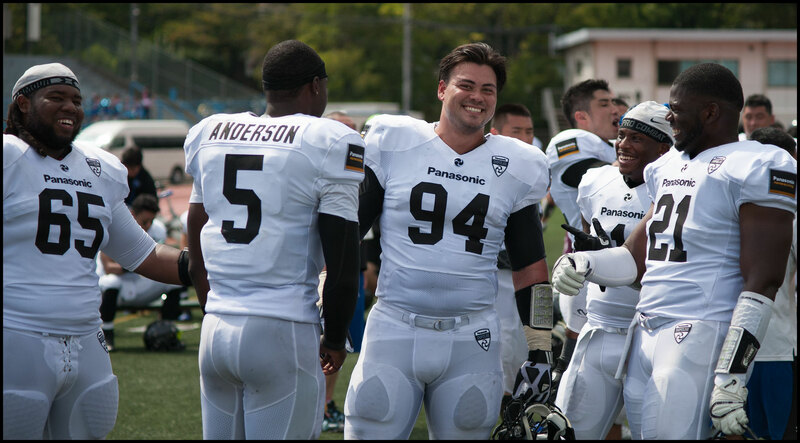 Showing their depth, all five Panasonic TDs were scored by different players. 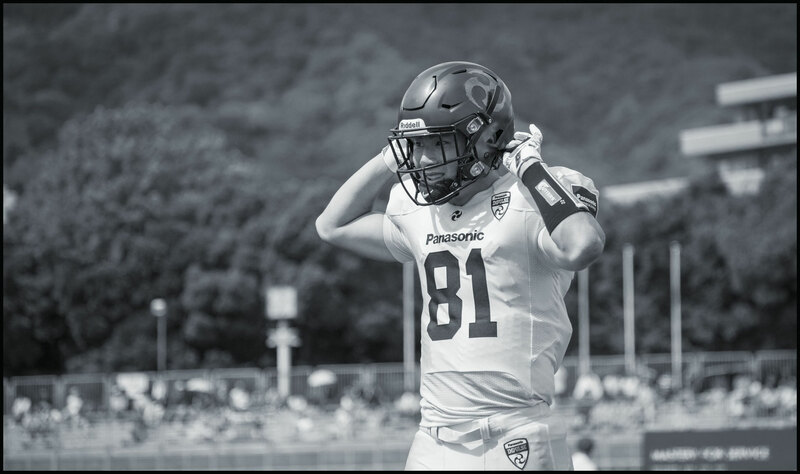 Alex Niznak still undeterred went back to what worked earlier and found Donnie King even deeper downfield, this time with two defenders on his back. 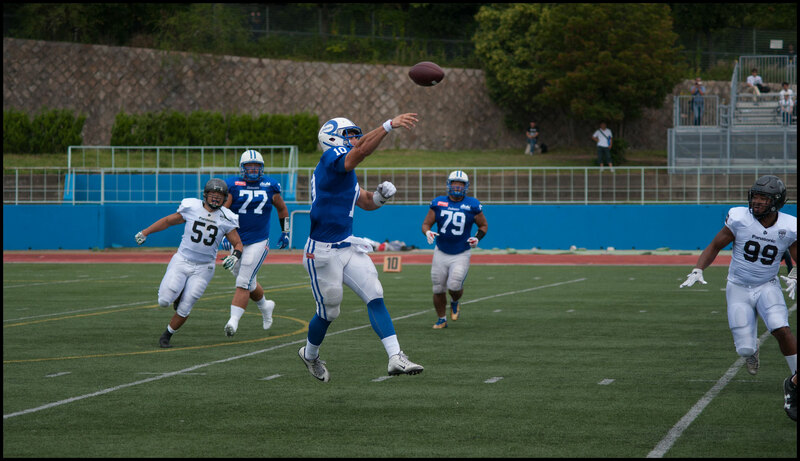 He again managed to come down with the ball. 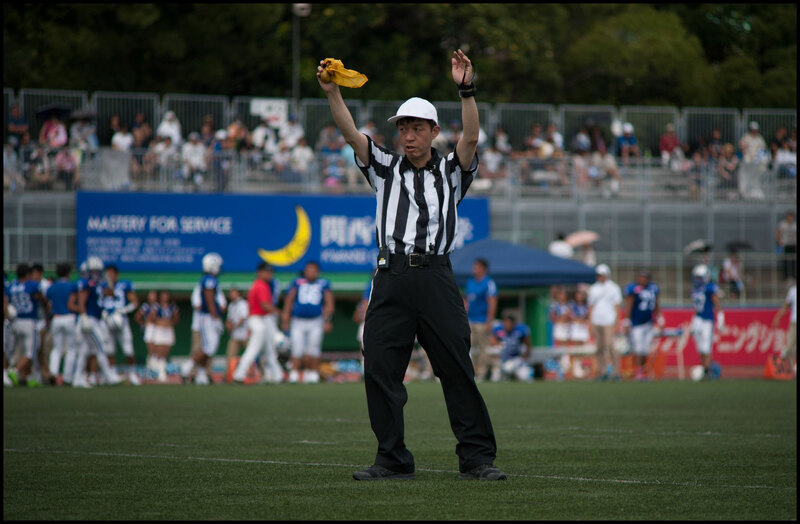 But that drive also ended without points for the Challengers, after they failed to convert on fourth and inches while within field goal range. 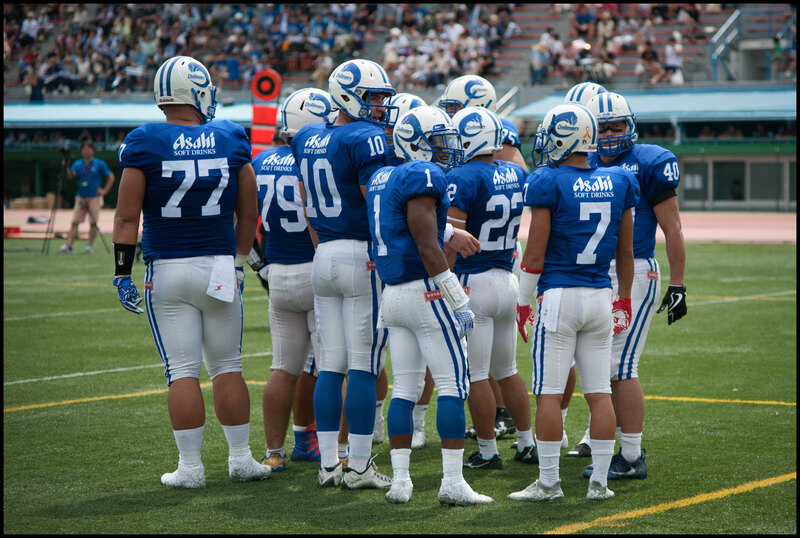 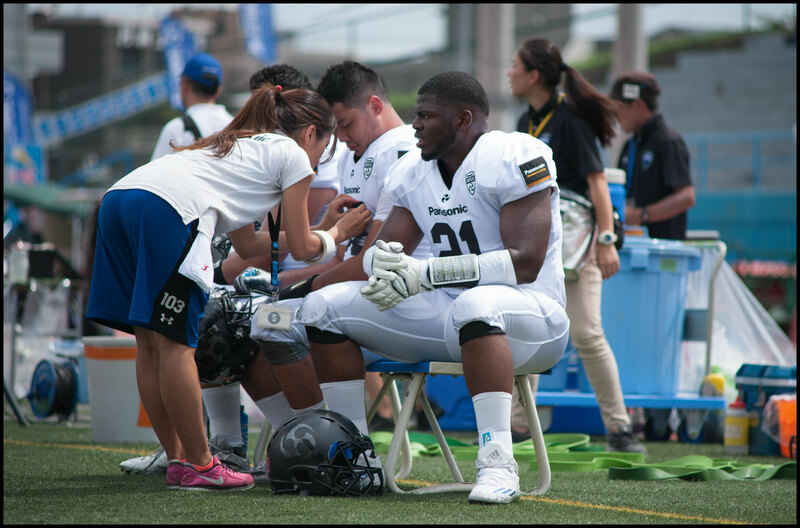 In the second half Asahi hurt themselves with penalties including a holding call that reversed a big first down run by Niznak. Seeing the opportunity to run was there again the QB took off once more and got the first down but that was the end of the good news for Asahi. 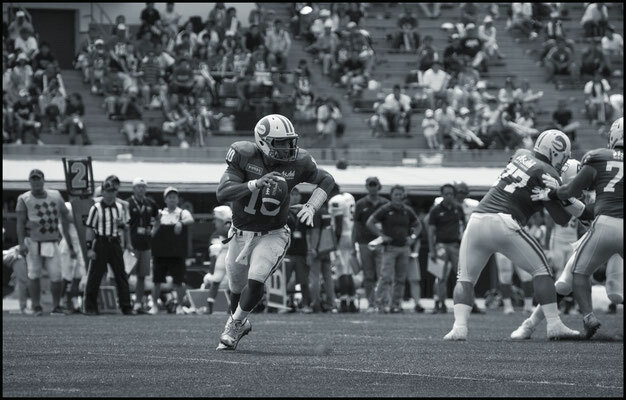 When he tried it a third time on the next drive, Niznak appeared to injure his arm and came out of the game. 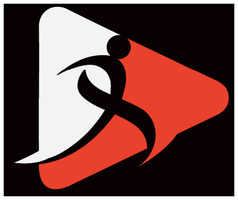 Injuries mounted for the Challengers. Donnie King came out of the game after taking a knee on more than one occasion and DB Keisuke Maeda was carried off on a stretcher in the midst of good game, including four tackles and two assists. 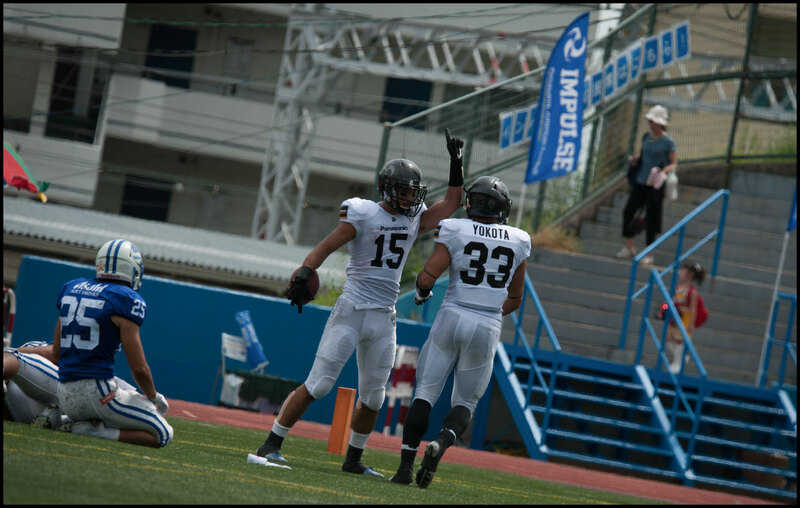 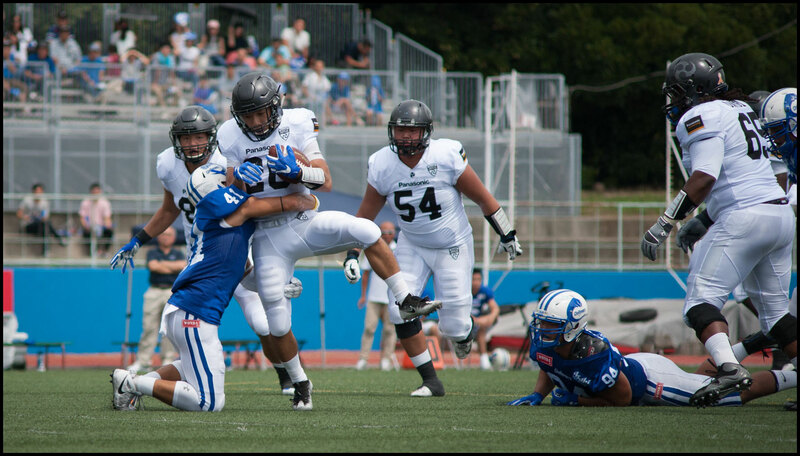 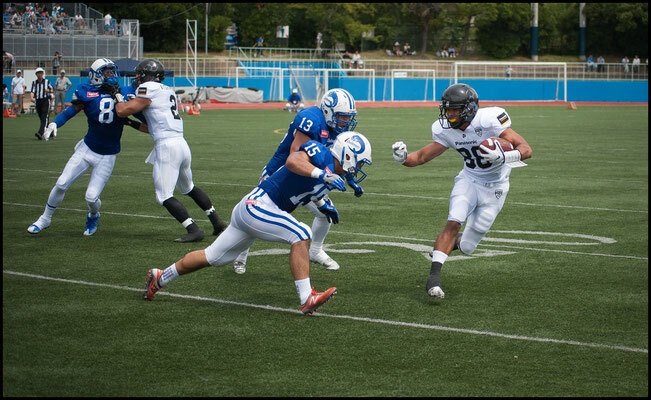 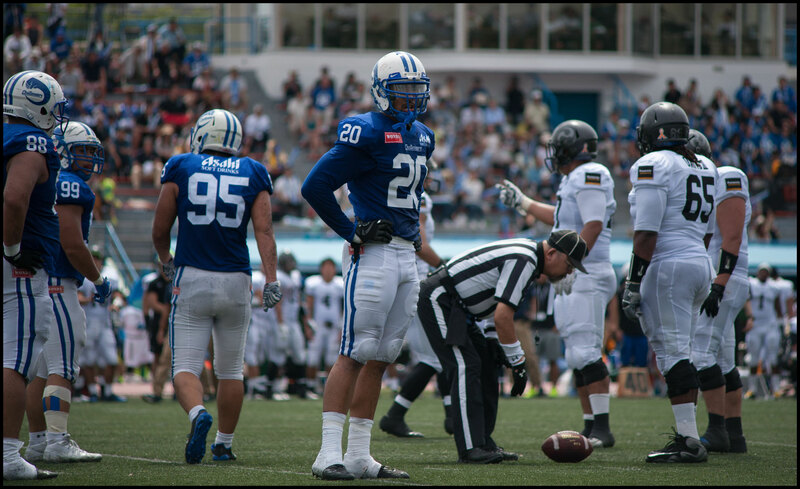 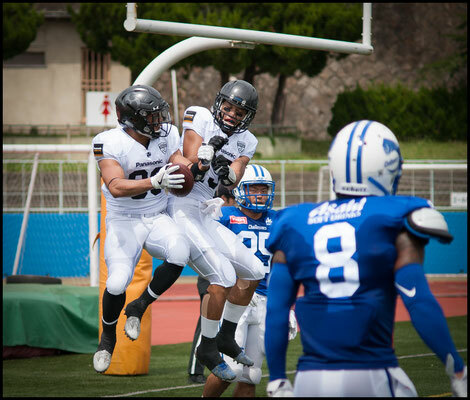 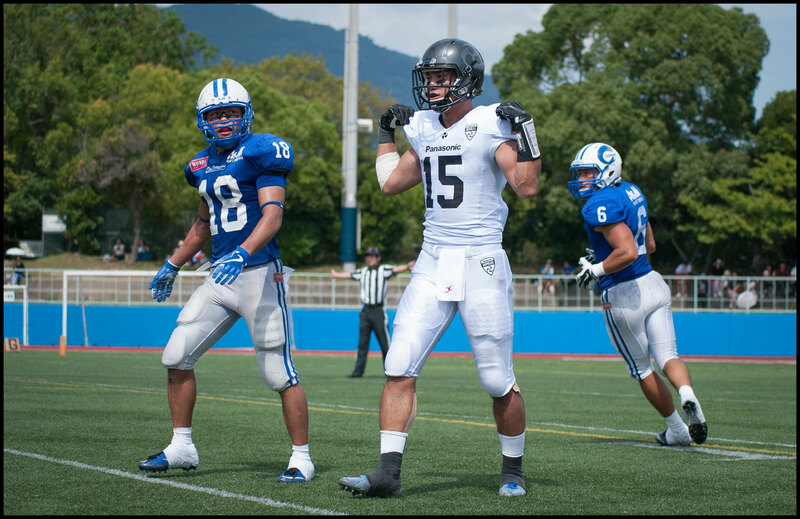 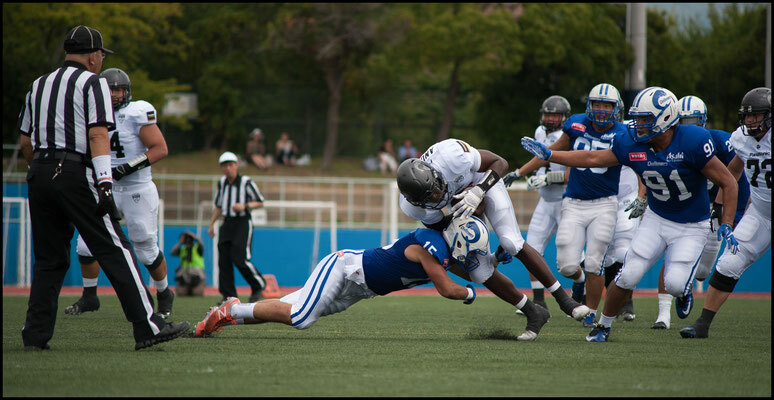 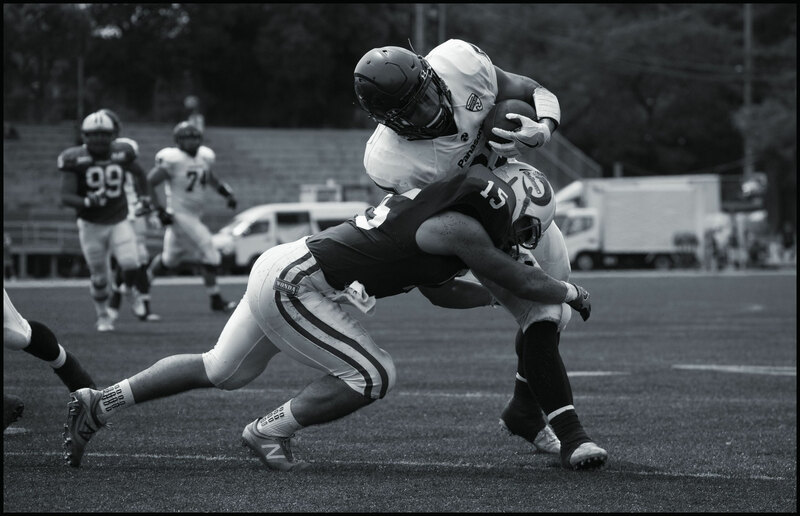 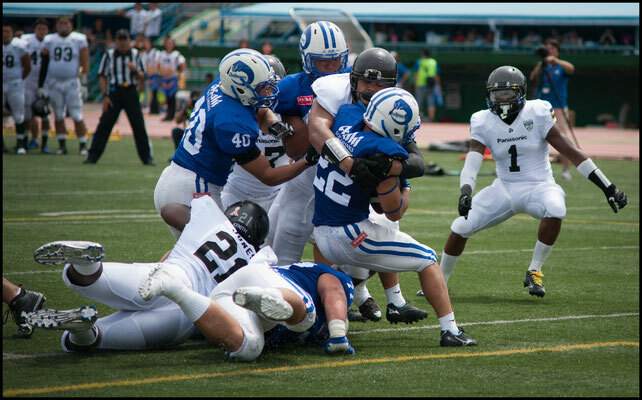 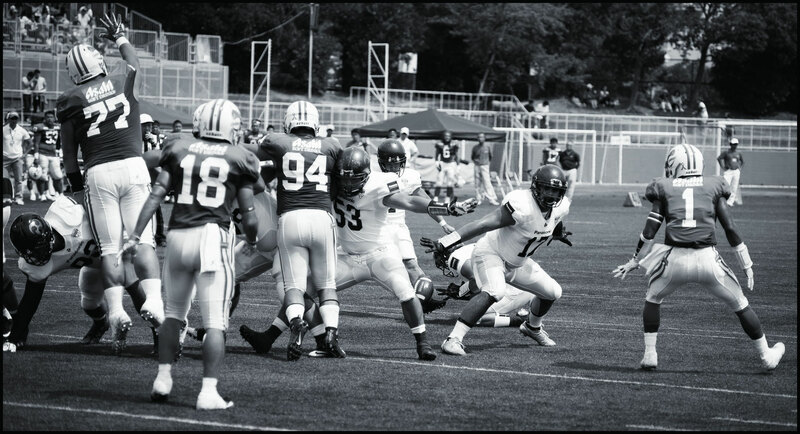 Maeda was leveled by RB Takuya Fujimoto who would not be stopped on his way to the end zone for a 34-yard TD. Asahi finally found paydirt and got on the scoreboard with less than a minute left in the game. 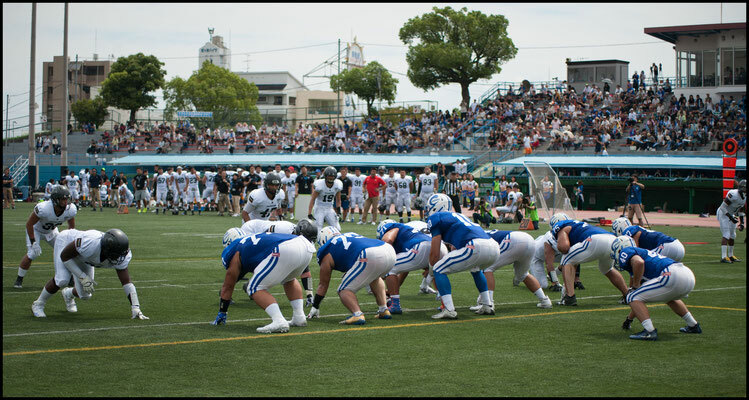 Both teams play in Kobe's Oji stadium again on one-week rest. 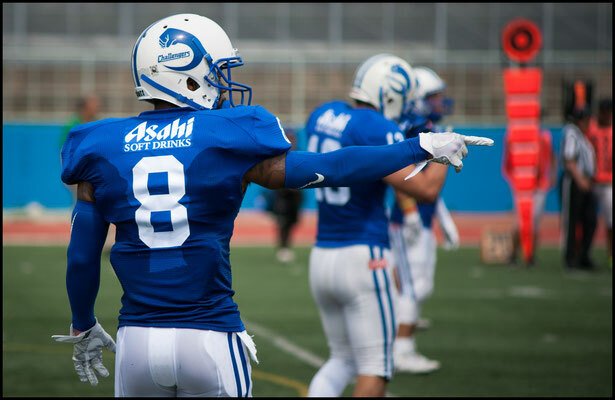 Asahi Soft Drink Challengers will have their hands full with Elecom Kobe Finies, who won easily in their week two tilt and Panasonic Impulse will look to stay undefeated against the As One Black Eagles.